Welcome to Dr. Liang's Clinic of Acupuncture and Chinese Medicine in Montgomery, Alabama. ​Our mission is to help you achieve and maintain optimum health through full components of traditional Chinese medicine, primarily acupuncture, and other adjunctive elements, such as Chinese herbs, cupping, electromagnetic healing therapy, electro-acupuncture, acupressure, reflexology, moxibustion, Tui Na, and nutrition counselling . Dr. Liang has more than twenty-five years experience as a Doctor of Acupuncture and Chinese Medicine. She received training from the Guangzhou University of Traditional Chinese Medicine, studying under a renowned master in China from the time she was eighteen. She worked for the Ministry of Public Health in China as a public health physician. 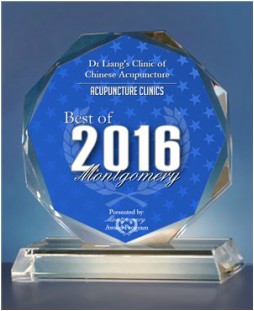 Dr. Liang opened one of the earliest Chinese acupuncture clinics in Montgomery, AL. Since coming to Montgomery, she has treated thousands of patients. Dr. Liang has a warm and compassionate bedside manner. Please support our NEW Facebook page: Click here! We are now offering gift certificates at our clinic. Acupuncture can be used for general health maintenance like strengthening the immune-system and treating different types of pain and disorders.